Maintaining a good relationship with your flatmates is about the most important thing you can do as a member of a share house. Anyone who’s lived in a house in which a relationship has broken down will tell you how tense, awkward and downright unenjoyable being at home becomes for everyone. So putting in some work to make sure things remain friendly is very much worth a little time and effort. Here are some easy ways you can help keen things on an even keel. With flatmates often on different schedules or running in different friendship circles, does it ever feel like you’re just strangers who sell hello in passing once a day? 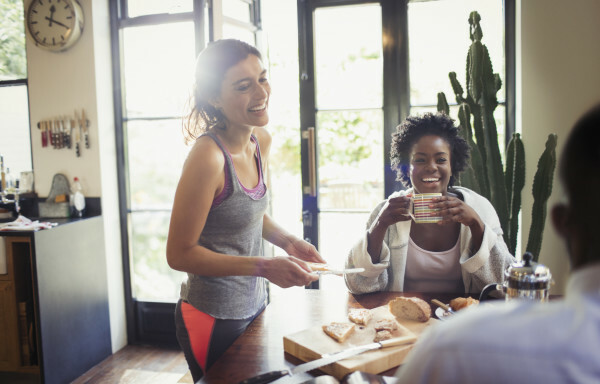 Making time to actually sit down and catch up with your housemates seems like a no-brainer if you want to stay on good terms, but unless you set time aside, it’s an easy one to let slip. It could be a fortnightly meal together at home, a Sunday afternoon beer at the pub or even a weekly TV show that you all enjoy together. Whatever it is, try to make time for a regular catch-up so you have some common ground. Given you might rarely all be in the same place at the same time, how do you and your flatmates let each other know about household-related issues like whose turn it is to take out the rubbish, someone having a group of friends around on a Saturday night, or that you’re heading overseas for a couple of weeks? It’s important to have an easy and effective way to communicate, whether that be a pin board in the kitchen, a private Facebook group or via a messaging service like WhatsApp. Find one that works for you and your flatmates, so that everything can be communicated quickly and easily and so that you’re in contact regularly. There are few things more aggravating as a housemate than discovering that something of yours has been used and either damaged or not cleaned or returned afterwards. Did they think you weren’t going to find out or care? Share houses are nothing without trust, so honesty is always the best policy. If someone wants to use something that isn’t theirs, ask first. If someone breaks something, admit it and offer to pay for a replacement or come to an arrangement to split the cost. No matter how close you are to your housemates, or how easygoing you are, it’s highly unlikely that it will always be smooth sailing. Eventually everyone does something that upsets a housemate or just simply gets on their nerves. And left unchecked, it could fester into something much larger. No one wants to create conflict, of course, but in the spirit of being open and honest, address any issues as soon as they arise. A quick reminder about a house rule or a friendly tap on the shoulder about something that might not be in the best interests of share house harmony is much better than stewing over it for weeks and allowing it to affect the relationships in the house. To enter and for full details.